Speak the Language From Day 1? Welcome to the third post of my series on “How to get speaking practice in a foreign language, and get fluent as fast as possible.” If you missed any of the two previous posts, you can easily access them by clicking here and here. As an aside, I recently had the wonderful opportunity to interview Moses McCormick, a well-known polyglot on YouTube who has studied over 50 (!) languages. His dedication and passion for languages is truly amazing, and his advice is priceless. You can listen to our interview by clicking here. Also don’t forget to check out his website, Road Running Language Camp. While this philosophy, that the only way to speak a language is to open your mouth and speak it, is hard to disagree with–and although it is strikingly simple, many people simply just don’t do it–one point of contention among polyglots and linguists concerns the when. When exactly should you start speaking the language you are learning? Benny says that you should get speaking ASAP. 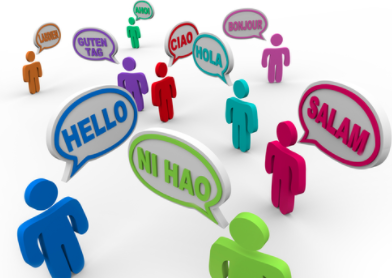 Other well known polyglots answer the question in the following way: you should speak when you are ready to speak, and/or when you have a vocabulary sufficient enough to at least be able to hold an everyday conversation with a native speaker. Others, like Moses McCormick, do not necessarily SPEAK the language in their early stages, but they join chatrooms where they WRITE in the language. And since Moses records his progress by filming himself, he does get some early speaking practice, even if it’s just in front of a camera. Personally, I usually tend to listen and read in a language for a significant amount of time—usually around 3 to 6 months—before actually speaking it (unless I happen to live in the country where my target language is spoken). The reason behind this is simple: having a very limited vocabulary does not make for very interesting, nor very long, conversations. Of course, I could have Skype lessons or language exchanges with natives as soon as I start learning a new language, but really in that case the conversations would end up being mostly in English rather than in my target language. Benny does manage to almost keep his initial conversations in the target language, but by his own admission, this method is brain-melting and very painful. In fact, Benny acknowledges that he does not actually really enjoy learning languages all that much. Personally, I prefer to take it easy when starting the study of a language, similar to what Luca Lampariello advises, and have fun with the language. Luca starts very progressively, initially mostly working with one or two textbooks at most (usually Assimil), and on average spends only 30 minutes a day on his new language. If you are not in a super rush to learn to speak a language then, my personal opinion is that Steve and Luca’s methods could be a good way to go. The best way to know if these methods work for you is to try them and see for yourself. Unfortunately, in language learning, there is no one-size-fits-all approach. I would, however, advise learners to actually enunciate the words out loud in the early stages, and to make a conscious effort to replicate the pronunciation that you hear in your recordings. Read out loud, and practice speaking words and phrases out loud too, so as to get the language on your tongue. Once again, all of what I previously mentioned here depends on your preferences, personality, and on what really clicks for you. I emphasized this over and over again in the past, and I’ll say it again here: whatever works for you is the way to go. That doesn’t mean you shouldn’t be open to different approaches, or try new techniques/methods with which you are unfamiliar or even uncomfortable at first. In fact, by being open to new learning approaches, you will get to know yourself better, both as a person and as a language learner, and you’ll be able to pick what works best for you and what doesn’t, simply through trial and error. The reason learning languages gets easier as you acquire additional languages is partly due to this fact. Through trial and error, and thus by getting to know yourself better as a learner, you begin to form habits and tricks; you begin to know what works for you. For example, around mid-2012 I spent a considerable amount of time acquiring vocabulary with flashcards. Within the space of a few months, I memorized well over 700 new Korean words/phrases. It did partly work for me, but I realized two things: first, the vocabulary I learned was too out of context and emotionally detached to really stick in my memory (plus, flashcards are rather boring…), even though I wrote several example sentences below each translation. Second, I felt that the time spent on studying flashcards could have been better spent reading blogs or interesting articles in the target language on what really interests me, thereby acquiring vocabulary more contextually and enjoying the language and culture much more. Even though I spent many months studying flashcards, I do not regret a single minute of it. I got to know my learning style and my preferences better, and up to this day I have constantly been finding what works best for me. If you love studying flashcards, I would wholeheartedly encourage you to keep going at it. But if you’ve tried it and you feel it’s too tiring/boring/useless, then by all means consider trying a different method. As a last word of advice, keep in mind that as you progress from the beginner, intermediate, and advanced stages of your learning journey, you’ll have to keep your flexibility and open-mindedness to new and different learning methods. You will invariably have to change your methods as you progress, and I would very much discourage anyone from sticking with only one method (i.e. academic/grammar textbooks) throughout one’s language learning journey. For more on this topic, see part 1/3 of my interview with Luca (watch from 11:15), where he discusses his methods through various stages of language acquisition. All this being said, I do believe that you have to open your mouth sooner than later. And the problem is that many language learners have this vague “idea” that they will “eventually” speak the language “sometime in the future”. Of course, we all know that “tomorrow” never comes, and many learners end up absorbed in their textbooks and unwilling to make contact with natives to practice the knowledge they acquired. Remember: knowledge and skills are two very different things. Driving a car is a skill, for example, and so is riding a surfboard. Of course, these skills require knowledge—the former requires knowledge of road laws and signs, and the latter requires knowledge of waves, wind, surfboard types, and so on. But very few are the people who would try developing driving or surfing skills through years of textbook study. Speaking a language is a skill, and it works very much in a similar way. So what I would advise you to do the next time you start learning a language, and this is extremely important, is to have a very clear written goal of when exactly you will start speaking a language, on top of clear written goals of how you will learn the language and how much time you’ll invest every day. This can be a precise date: for example, “I will start speaking with natives over Skype after 4 months learning Spanish.” Or it could be related to going through a particular textbook, for example, “I will start speaking with natives over Skype as soon as I finish this Assimil textbook.” Whatever goal you make for yourself, stick with them, and get the language on your tongue as soon as you can. Without any clear goals, you’ll keep procrastinating and you’ll wait for perfection before opening your mouth. Perfection never comes. Let me show you an example of a danger that lies in being too absorbed by your books. Some language learners—many of which I have personally witnessed—are so absorbed by their textbooks that they would gladly turn down the opportunity to have conversations with native speakers in their target language in order to focus, instead, on learning more grammar, memorizing more sentences, expressions, and idioms, and going over once more their sets of flashcards. I am guilty of this too. So back a few years ago, when I was living in Australia, I met a few Koreans that had come all the way from Korea to spend a year relaxing Down Under, away from the hustle and bustle of the “land of the morning calm”, but also in order to improve their English skills. They would gladly strike a conversation in somewhat broken English with me as well as with all of the fellow travelers at the caravan park where we all stayed, but usually at around 8pm every evening they would simply tell all of us that their “textbook study time” had come and that they would have to retreat for an hour or two. Now, don’t get me wrong, studying a textbook can be of immense help, but it does not even come close to the actual experience of speaking the language with actual people. I was quite shocked the first time I heard them say this, because I simply could not get my head around this type of reasoning. Why sacrifice precious time with friends, immersed in your target language, for textbook study time? So with this post, I hope you will have understood that what I am advocating here is to get to know yourself better as a learner through experimentation, and that you also have to force yourself to go out there and open your mouth sooner than later. As I mentioned, in my personal case I usually start speaking 3 to 6 months after having started learning a language. Benny advocates speaking from Day 1, and other polyglots advocate waiting for longer than this. Depending on your goals, on your situation, and on your personality, these might of course vary. Nevertheless, if you have been studying a language for longer than a year and you haven’t gotten around speaking with a native yet (because of fear, insecurity, shyness, or else), I would thoroughly encourage you to make the small step necessary to make it happen. In my previous post, I included several resources easily accessible to anyone with an internet connection. And since you are reading this, you have of course no excuses not to do it! Remember, as Stephen King once said, “The scariest moment is always just before you start.” Open your mouth, and believe me, nothing bad will come out of it.